1. Energy Efficiency – Efficiency ratings are like gas mileage the higher the rating, the more efficient the product is. All products are given the following ratings, so you will know exactly what to expect from your investment. This measurement gauges the heating mode of heat pumps. Most new units have ratings from 7.0 to 9.4. The Infinity 17 heat pump receives up to 9.5 HSPF. This measurement gauges air conditioning cooling. All new models are required to have at least a 13.0 SEER rating. The Infinity 18 air conditioner receives up to 18.0 SEER. Carrier Corporation has determined that certain products meet ENERGY STAR® guidelines for energy efficiency. Look for this logo on our Infinity and Performance Series products. Puron® Refrigerant – Carrier was the first to introduce a new, non-ozone-depleting refrigerant called Puron a full six years ahead of the competition paving the way for the future. Puron refrigerant is chlorine-free, so it doesn’t damage the Earth’s ozone layer. And, as other refrigerants become less available, Puron refrigerant will be the refrigerant of choice for years to come. Carrier specializes in creating a customized home comfort system with our broad selection of heating and cooling products. Your Carrier dealer can help you choose the best system for your home including Carrier-exclusive features that further enhance your indoor environment. 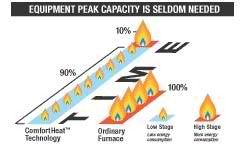 ComfortHeat Technology accurately predicts the need for heating while cutting temperature swings in half, and provides a nearly continuous flow of warmth in low-capacity operation for a steadier, more consistent indoor temperature. When a heat pump or air conditioner is combined with a variable-speed furnace or fan coil, the revolutionary Infinity System is the only system in the industry that allows you to control temperature, humidity, air quality, fan speed and ventilation. The Infinity System even detects when your air filter needs replacing . Its so advanced it automatically adjusts to your system’s needs for peak efficiency and performance. Its the ultimate control center for all of your home system components. Ideal Humidity Systems IdealHumidity Systems automatically add or remove just the right amount of moisture to keep your home comfortable. Ideal Humidity Systems can help you save on energy costs, too. When the humidity is right, you can feel comfortable at higher temperatures in the summer, and lower temperatures in the winter. Home comfort should not come at your hearing’s expense. This is why quiet is built right into every system. Carrier furnaces feature the Quiet-Tech noise reduction system that provides comfortable heat while generating very little noise in the process. Carrier air conditioners are also quiet, thanks to the exclusive Silencer System that ensures extra-quiet performance by maximizing airflow while minimizing vibration. With sound ratings as low as 69 decibels (dB), Carrier’s Infinity Series air conditioners make less noise than a refrigerator.